Chart based on 228 repairs. 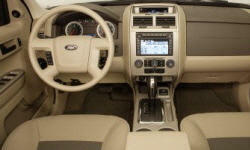 See TSBs and recalls for the 2009 Ford Escape. Chart based on 154 repair trips. The repair cost chart excludes repairs made under warranty, do-it-yourself repairs, and repair trips that include maintenance. C $150 The heater plug front end broke. Was not covered under warranty. Ford should not sell vehicles with poor quality heater cords in northern Alberta. ¤1200 Open wrench shown on my dshboard. When it's shown the engine is still running but no power even when I tried to apply power on the accelerator. US $600 "frozen" caliper on front passenger side. Replaced caliper, brake pads and had rotors turned. 17000 mi Window washing system problem. Fixed by replace parts second time. 47000 mi Self diagnosed engine light as P0012, No drivabilty problems. Cleared and it came back, twice in three weeks. Now light is still on, will take to dealer for repairs, Doesn't seem right to have problems this early with a near new car. Dealer ran a ebd scan, found 3 codes, ordered parts said they were on major backorder will call when parts arrive. Don't have a clue as to when we see them. 52000 mi engine light came on, dealer ordered and replaced parts so far no reoccurring light. time will tell. US $75 back-up sensor Failure, replaced 2 sensors. 24000 mi Fluctuation in air temp from driver to passenger side. Dealer replaced two actuators and I was told that a 15 degree difference in temp was normal from side to side with dual auto climate control The problem remained. They did reprogram the computer after I told them I would not accept this answer from their rep. Then the system seemed to function normally. US $450 Rear hatch latch would not open. 18600 mi Transmission is toast. From the net this a common problem in 09 Escape. Short of completely replacing transmission and waiting for parts etc. the problem of crappy shifts (and I mean crappy) will remain. Don't want to be without it for the time needed. 22000 mi Check engine light, dealer replaced VCT solenoid. TSB. US $6 Rear electric door latch failed. I replaced the actuator motor. US $115 TPS sensor issue, replaced throttle body with updated unit. C $450 Cam phaser codes. Replaced solenoids per TSB. C $20 Liftgate lock actuator failed. Opened actuator, diagnosed as small Mabuchi electrical motor, bought on ebay ($20) and replaced successfully. Junkyard actuator assemblies were $75. New - $200. US $250 Spark plugs & head gasket. 17360 mi Recall for the automatic transmission. The transmission was clunking when put into reverse gear after shifting from forward to reverse several times in a row at slow speed, as in maneuvering into a parking space. Had me worried. Software update fixed it. C $180 The outside pad holder seized close to the rotor, causing rotar damage on the drivers front. The Passenger side pads and rotors still had plenty of wear left. I felt this was way to soon to have to change pads and rotors. C $108 Front sway bars rattling. Both needed changing. C $170 Lots of front end noise and similar noise from rear. Clunking, hollow rattling type noise going slow or fast over small bumps. Replaced rear sway bar links and tightened up front link. Sill hear a noise from front end. C $1340 My gas tank rusted out and leaked badly. Vehicle is just over 5 years old with 77K on odometer. I replaced the fuel tank. The tank was 900.00 and the installation costs were 250.00. The entire cost was 1340.00 CAD. C $35 Replaced the outside Temperature probe, th eone that shows current temperature on the dash. C $353 Engine light on. Cam shaft position sensor. Needed two position solonoids, $80 plus tax CAD each plus several hours shop labor to install. 17000 mi Found that tech adjusted trans fluid level incorrectly (2nd time) - and now was too high. Had them re-adjust the fluid level (3rd time)to the Ford recommended level for flat towing as per the TSB released. US $450 Vehicle is towed behind a motorhome. Brake calipers, rotors and pads replaced - caused by misadjustment on supplemental braking system. Ball joints replaced - Ford blamed this on towing, though I believe the problem existed prior to. 36000 mi After getting window glass replaced under recall previously, rear pass. door handle not opening door from inside. Previous dealer had not re-connected correctly. 89000 mi Passenger side fender at the wheel lip starting to rust out. At the spot welds failed, water had gotten in between the sheet metal. Bubbling and rusting occurring at the edge of the wheel well. 49600 mi shift mess, ATF burnt, metal found in ATF. C $130 water pump leaking, replaced a new one. C $100 Rear wiper motor got stuck and hinge on rear tail glass was corroded. US $400 Wrench light came on (not the engine light) and the dealer said it was the 4x4 control module losing communication with the vehicle and needed to be replaced, even though the 4x4 and traction control worked just fine. But replaced anyway. US $40 Injector on cylinder 2 died. Replaced with new Injector. 99000 mi Getting check engine light referring to cylinder 4 misfire upon startup. Replaced injector, no luck. Replaced spark plug, no luck. Replaced ignition coil, no luck. Sold it with the problem remaining. US $50 Engine light indicated excessive camshaft bearing wear requiring new camshaft cones. Found 1 qt low and filled lub oil. Light went out next day. 17500 mi squeaking in rear of vehicle, sounds like coming from back seat latch. dealer advised coming from back glass. told me because I drive on dirt road (2mi/day) dust is getting on the glass under the rubber seal, they applied grease. rear back glass greased by dealer, but started squeaking again on way home from dealer on paved road. US $40 heard noise in transmission area then in right front area, dealer claims it was dirt & rocks wedged underneath. Also they were saying I must have high centered it, not true. I drive 2 miles/day on a dirt road with minimial gravel. Phoned Ford to inquire/complain that must be manufacturing flaw if dirt/rocks cause excessive noise on AWD off road vehicle. Really didn't care, also mentioned back glass issue. Advised will tell engineers, but didn't really seem to car Mentioned that unacceptable that back glass should require greasing, who ever heard of such. Also didn't realize I would have to crawl under my vehicle everyday to remove rocks & dirt that may have gotten under it. Would not recommend this Ford Escape to anyone buying it for use other than paved road. Apparently isn't capable of going on any other surface without issues with dirt/gravel build up. Local Dealership service worker lied to Ford rep about what I advised the issue was. Totally unacceptable. Do not recommend local service department. US $60 Replaced right front tie-rod end Replaced both rear sway bar tie-rod ends. 26040 mi Drivers side window was rattling & rubber trim needed replacement. Rear axle seal was leaking differential fluid. 27900 mi Rear axle seal on 4WD system was still leaking (weeping) slightly. 52080 mi Leaking rear axle seal (2nd time! )repaired under warranty. Advised that the front sway bar links need replacing at the same time. We had to pay for this repair. Been advised that the front control arm bushings were failing & that the entire control arms have to be replaced on both sides (Ford does not allow you to just replace the bushings!). This is very disappointing. US $750 Electronic Throttle Body failure. Caused car to go from 60mph to coasting. Towed vehicle. 16000 mi Transmission re-flash per bulletin. 21000 mi TSB 9-12-6 for blend door actuator replacement. Symptom was inconsistent and erratic temperature control on dual climate control system. Under warranty, the temperature blend door actuator assembly was replaced on both sides. Car has dual climate control and temperature varied erratically from side to side. There is a TSB for this (9-12-6). 36000 mi Both cam position sensors on 6 cylinder engine replaced after check engine light and code indicated need for repair. 34700 mi Fluid leak seen on garage floor. Seal replaced. 36000 mi Rear hatch electronic latch failed. Glass latch still worked. US $108 Lower two speeds of interior heating/cooling system fan didn't work. Fan resistor pack replaced. Transmission leak fixed. Paid deductible for extended warranty. US $2800 Transmission leaked and fluid level went low enough to cause damage. The transmission was rebuilt. C $50 Clunk in front end over bumps, changed the stabilizer links, all good now! C $108 Replaced balljoint on passenger side. The transmission had a recall for leaking seals when the Escape was new, the tech damaged the ball joint boot when taking off the control arm. So over time water and dirt got in and caused it to fail prematurely. 13300 mi Transmission leak: Replaced drivers side half shaft, bushing and seal. Drivers Side wheel bearing replaced. Mechanic found problem during test drive after fixing the halfshaft. $150 the muffler was broken making fuel consumption go high and the car very noisy. 16000 mi Checked for rain-caused leak at top of hatch window. No cure provided-"couldn't duplicate" was reason given. Still occurs. Have not returned to dealer. 52000 mi Powertrain light (wrench) displayed. Engine in limp mode. Turned off ignition, restarted; ran ok. Dealer replaced electronic throttle body under warranty. No cost to me. 81300 mi Replace Electronic Throttle Body. 106640 mi Rear window hinges are oxidizing at an alarming rate, They're losing all structural integrity. Window will eventualy fall off or shatter. Ford has no comment on this issue. 96100 mi Rear window hinges never fixed. 24000 mi Shift issues going from 2nd to 3rd and going from 4th to 5th gears. Very high revs in between shifts. US $500 Vehicle would not start, key would not turn all the way to engage the starter. Ignition replaced. US $380 Cylinder 1 misfire code, replaced plugs and coils, did fix it. Then replaced a bad fuel injector, didn't fix it. Sold the car for parts. 5000 mi CD player will not eject disc. 20000 mi Transmission fluid leak, took 27 business days to repair. 7000 mi The trans had a leak and there was a service bulletin on the left trans case. Per my request they replaced the whole transmission. 6000 mi leaking trans. oil, parts were on backorder dealer gave me a loner car, they had my car for 3 weeks. US $260 Drivers side seat belt would not unbuckle. Had to use force to get it to unbuckle, then drove around with it dinging for a damn week until I could get it into the dealers. They fixed and did not charge me for the seat belt. Discount Tire damaged the tire pressure sensor when they were fixing a flat. The Ford Dealer replaced the sensor and gave me a discount on the part as Discount Tire would not accept responsibility for the repair. My dealership is good. 70000 mi This was a recall where they flashed the computer for the transmission. US $1850 Had to replace a/c evap. Don't know all the parts. US $950 Check engine light came on, autozone said it was a purge valve that needed to be replaced. Took to mechanic, Kinneys Automotive in Hurst. They said they had to replace everything from the gas cap to the engine, cost 950.00 and took three days. The check engine light came on, I took it to Kwik Kar in Hurst, TX. They ran the code and said it was the purge valve. Said it might be gas, so they reset the code, I drove it for two weeks, check engine light came back on, error was the purge valve. they changed it for 99.00. also flushed out the gas area as there was an error code about it. the gas cap error light has been coming on and going off for over a year now. hopefully its all fixed now, and I will never go back to Kinneys Automotive. 5000 mi Transmission Vent line re-routed. 39000 mi Replace axle bushing and seal, replace worn axle. Clunky transmission action, especially in lower gears. About to take car in for this when received recall notice. US $500 Blower motor resistor went out (low fan speeds did not work) which caused desiccant to become contaminated. Required replacing the desiccant canister and recharging the system. US $6160 at 260435 miles the transmission failed. Initial cause was a loose front left axel. This caused a transmission fluid leak which resulted in the transmission running out of fluid and overheating which effectively destroyed the transmission. cost to replace was 1958.00 in labor and 3796.00 in parts. Only reason this was done was because vehicle would have to be scrapped which would have negated past repairs. Plan now is to keep car as a 2nd vehicle intermediate shaft, transaxel oil cooler, transaxel assembly, left front constant velocity driveshaft also replaced. US $80 replaced heating fan speed selector motor. 19840 mi TSB 10-10-1 6F35 Transmission - New dipstick and filler tube kit. Transmission fluid was leaking from dipstick tube area. 21700 mi Leaking transmission oil from dip stick vent. Replaced transmission case half and pan filter. 23920 mi Clicking noise behind dash - Replaced right and left blend door actuators TSB 10-8-6 Chrome wheels were all corroding on lip. Replaced all 4 chrome wheels. 27900 mi Squeaks and rattles from rear hatch. Lubed and repositioned rubber hatch seal and adjusted rear hatch striker. 34720 mi "Check Fuel Fill Inlet" warning was going on after every third or fourth fillup. As per TSB 11-11-28, caused by a leaking / stuck evaporative emission purge valve. They replaced evaporative emission cannister and purge solenoid. 18600 mi Reprogramed the powertrain control module to the latest calibration, to avoid future solenoid regulator valve bore to wear which could result in transmission slips and/or harsh shifts and premature clutch wear and loss of 4th to 6th gear. 23440 mi The filler neck on the gas tank filler tube came apart, bad glue joint(factory defect). Replaced filler tube assembly. Lost the 1st and 2nd speed on the heater fan, changed the resistance module that controls heater fan speeds. 9000 mi Cruise control problem - after using cruise control, applied brake to turn it off, then accelerator became "stiff" and could not maintain speed. Coasted to shoulder, turned car off and restarted, problem went away. Dealer could not replicate. 14000 mi passenger side window regulator failed with window in open position. US $267 Wrench light came on, car hesitated on acceleration and ran roughly. After car turned off and restarted, problem did not reappear. Did not set codes, after diagnosis no repair done. Light showing "passenger airbag off" stays on even when adult passenger is in seat. Set low battery code, so battery replaced. Light continues to come on. Jan 2012 Engine didn't have a lot of power and ran rough. Replaced canister purge valve. US $150 Noise from the back when going over bumps. Diagnosed as rear hatch door. 10540 mi check engine light on for 2nd time. This time code was for "evap". Dealer guesses it is caused by the capless fuel filler system. He reset engine light. It came back on 3 days later. rear hatch lock actuator does not work anymore. Therefore cannot open hatch. Can still open rear glass. 21080 mi wire harness to electric water pump was frayed, had corroded, and only supplied intermitent power to the inline water pump. caused electric motor overheat warning. limped car across town, stopping for it to cool. dealer replaced wire. 30000 mi Engine light came on found codes - P0022, P0012, P0341. Due to excessive wear to cylinder head it was replaced on left side, VCT's and gaskets. Replaced thermostat and gasket. 17000 mi Rear wiper motor. 37000 mi Drivers seat bracket rusting. US $50 Hybrid. Actuator problem. Ventilation and cooling for the batteries. 58600 mi Tire air pressure sensor. US $400 Sway bar Another tire sensor. US $650 The car would not drive over 20 MPH. Throttle Body was shot. Also replaced engine battery. US $112 Replaced throttle body with Genuine Ford part: DS7Z-9E926-D. This was done to correct issue where the wrench and check engine lights came on and the car went into "Limp Mode". This was a known issue to ford but not under warranty for my car. US $82 Rear hatch would no longer open. When you push the open button you could hear it making noise but the latch would not release. The "Tailgate Lock Actuator Motor" had worn out. I replaced it with a "Dorman" brand part from Amazon. Fixed. US $150 Replaced thermostat and water pump. Discovered a small A/C leak that I did not repair. US $372 The A/C main gasket was leaking R-134A refrigerant slowly which made the A/C not blow cold. I had valvoline drain the existing refrigerant out of the system, then I replaced the A/C compressor myself and had Valvoline recharge the system. Cumulative time at Valvoline was about an hour. The replacement of the A/C compressor took me about 5 hours. The car was making a wub wub wub wub noise that got louder at higher speeds. Les Schwab diagnosed it was a worn-out wheel hub and bearing and repaired it. US $250 Alarm for Tire Pressure Sensor. Replaced. US $5 Rear hatch lock motor failed. Hatch would not open. $5 part, about an hour labor. US $90 Check engine light for upstream oxygen sensor. New O2 sensor did the trick. Simple fix and expected at this mileage. 11000 mi Check engine light on for fuel system evap leak. 67580 mi As a condition of the purchase, the dealership selling the car repaired leaky satellite aerial "puck" on front right of roof and cleaned water stains from headliner. C $60 Replaced faulty ambient temperature sensor in front bumper. Replaced one defective (chirping) temperature blend door actuator. C $650 Electric power steering boost failed completely, no warning. Known problem with Ford Escape Hybrids, but no recall yet. The repair requires replacing the entire steering column assembly. Update: later recalled and I was reimbursed $2233. Water pump leaking. $500. One Tire Pressure Monitor System sensor failed. $150. C $100 Replaced rear glass hatch weatherstripping using abundant additional sealant over flange. Fixed many leaks through license plate, high mount brake light and logo trim panel fittings by disassembling, cleaning and installing new gaskets. C $280 Coupler-to-steering shaft bolt came loose. Very dangerous, I reported this to Transport Canada, should be recalled. C $50 A/C lines under body to traction battery hvac unit in cargo area corroded through and lost refigerant. Had to replace both lines. At least one backup sensor failed in rear bumper. C $780 Replaced both sway bar links, and one tie rod end. C $610 Replaced one failing front wheel bearing. C $80 Deteriorated rear hatch weatherstripping was allowing water to get sucked around pinchweld seam around rear hatch opening, adjacent to latch. Repaired rust on flange, replaced weatherstripping. US $150 Front Sway bar link's were worn and loose and replaced. US $100 Display screen stopped working. The fault in display blew fuses so the entire display unit had to be replaced. Common. It is $500 part. I used one from an auto recycling source for $100. Jan 2010 Transmission skipping gears. See our lemon odds and nada odds page to see vehicles with no repairs or vehicles with more than three repairs. 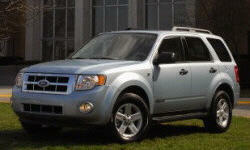 To see how frequently 2009 Ford Escape problems occur, check out our car reliability stats.